AMM blog: Studio Esinam giveaway! The wonderful Gothenburg based Studio Esinam is giving away a copy of their New York elevations to an AMM reader! Leave a comment about where in your home the New York Elevations will go by either leaving a comment below or on the Instagram post. Giveaway ends Saturday at midnight, MST. Just moved into a new apartment that has a giant blank wall. It will be the perfect piece of art to look at! I would love to hang this in my living room! Oh, this beauty would hang in our dining room. My sister spent some years in Berlin.I remember visiting the " Gedaechtnisskirche and the Fernsehturm" :-). I'm architecture student and I'm finishing touches on my own apartment. It would be a perfect inspiration piece on my studio room surrounded by white walls, plants and wood details. Such a beautiful drawing!! My boyfriend is an architecture nerd, and complains that the art in our living room is too girly, so I'd swap this great print out with a "girly" flower photograph (which, truth be told, I'm not that crazy about, either). Im gonna hang it on my entrance wall next to my original Amsterdam old canal drawing is, a drawing which i'v got from a special former client of me in Amsterdam. I love stduio esinam's art work! As a math student, I find the beautiful, crisp lines of architecture both calming and inspiring. I would hang the print right above my desk so that anytime I look up from my work, I will have a piece of NYC to look at. 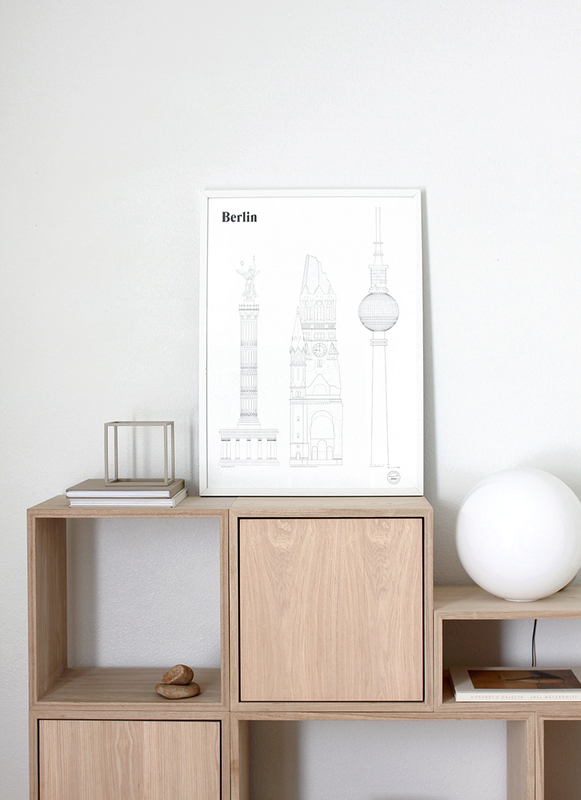 Living in a cozy Berlin flat, I could do well with the Berlin print (of course, it would accentuate the whole inside/outside and home discourse), but the New York print would be a great addition, too. I have a large, colourful Alexander Calder edition on my sideboard that sits there a bit lonely if it wasn't for some delicate concrete sculptures. Calder being closely tied to New York, part of the history and collections of some of the buildings in that beautiful print, would finally find back to his roots! I just moved, and this would be perfect on my gallery wall in the entrance hall! i'd put it above my couch in the living room. i'd want everyone who comes over to see it! our hall still needs a welcoming art work. but one thy also encourages to discover the world! I visited NYC in February and it would be a great reminder of this amazing trip. Definitely my bedroom! I'm recently been into minimal low color art! Oh. I just returned from NY, love it, again! We are building a new home for us, so I´d put it in the new living room. Love it. My home office has a black and white theme and that is where this beautiful art would go.